Casino dealing can be a very lucrative career choice if you have what it takes to be a good dealer. A good dealer will have to be very swift and sharp, he/she should be able to cope up with the high pace of the casinos and must be very sociable. Q: What are the requirements for becoming a dealer? A: In Nevada and in most other states too, the minimum age required for being a dealer is 21. Before the dealer would be hired by a casino, he/she will have to go through a background check which will be done by the casino. The dealer should be drug free, should not have committed a felony in the last five years and should not have any large debts. Once hired, the dealer will have to get a license. You may get familiar of how to choose a casino dealing school before enter any courses. Q: How long does it take to complete a casino dealing course? A: The time frame for casino dealing courses tends to vary depending on the type of the game. 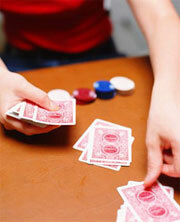 Blackjack is an easier game so it takes only 3-6 weeks for students to complete the course. Games like roulette and craps are difficult and take at least 6-8 weeks. Poker Dealer is one of the most popular types of dealing and it takes around 6-8 weeks to learn dealing poker and all of its variants. Q: What do casino dealing courses normally cost? A: Again the cost of the courses at casino dealing will vary widely depending on the school itself and the course attended. Blackjack is the least expensive course to attend while poker is the most expensive. Q: How will a person get a job after completing the course? A: After completing the course, the dealer will have to attend interviews and audition for the position of dealers at various casinos. Whether or not he/she will get a job will depend on the skill levels and the performance at the interview. Q: How much can a dealer earn? A: Normally, the wages of a dealer would be around $5.25 per hour not including the tips. The tips would depend on the casino and the city where the individual is working. Normally, even at a normal small casino a dealer can earn as much as $300 as tips every week. At larger casinos the tips tend to be larger. In good casinos the tips can be $400-600 per week. In the most well known casinos like the Bellagio, Venetian etc, the tips exceed $200 per day. The hourly wages of dealers are not very high but the tips make up for it. There are even several cases where the players tip extravagant amount of money as tips to the dealers. Q: What makes a dealer successful? A: efficiency, positive personality, attitude, helpful attitude all help a dealer to be successful. A dealer must be swift and very sharp and must know the games very well to be able to be successful as a professional career.